A couple of week’s ago, PinkPolkaDot asked us in her food quiz what Gamelli was. I was given The Geometry of Pasta for my birthday, so I used the book to answer the question. I then decided that I would make the green bean pasta recipe given in the book, and, as it has 5 ingredients it qualifies for the challenge. Remember, this challenge ends on Sunday at midnight. According to The Geometry of Pasta by Caz Hildebrand & Jacob Kenedy gamelli ‘the twins’ are related to fusilli as another complex helix. In this case, always with two blades, but the blades are curved until they almost enclose themselves to make tubes – somewhat like twisted casarecce. They are an example of pasta architecture at its best and, as with all good architecture, not only for adults to enjoy – children just love gamelli, and other entwined pasta’s. 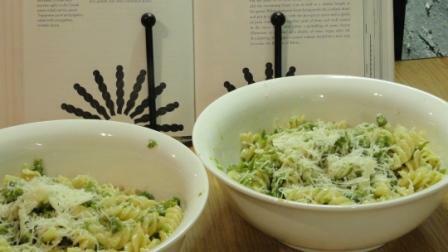 As I could not find any gamelli I decided to make this green bean pasta dish with fusilli. In this recipe, cinnamon is an integral ingredient and so I have not counted it as seasoning.